One of the principal objections which have been urged against the wave theory of light is the fact that light appears to travel in straight lines, whereas sound, which is known to be a wave motion, does not cast a shadow; in other words, the sound waves are capable of bending around an obstacle in the path of the waves. 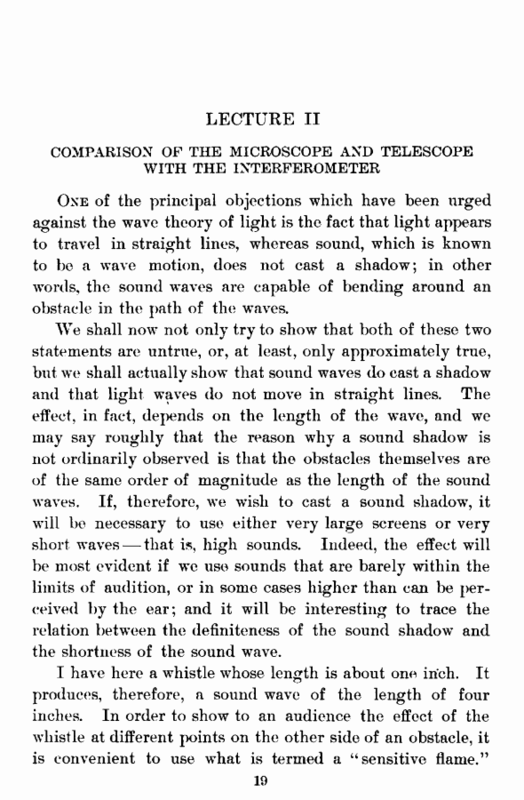 We shall now not only try to show that both of these two statements are untrue, or, at least, only approximately true, but we shall actually show that sound waves do cast a shadow and that light waves do not move in straight lines. The effect, in fact, depends on the length of the w’ave, and we may say roughly that the reason why a sound shadow is not ordinarily observed is that the obstacles themselves are of the same order of magnitude as the length of the sound waves. If, therefore, we wish to cast a sound sliadowT, it will be necessary to use either very large screens or very short waves — that is, high sounds. Indeed, the effect will be most evident if we use sounds that are barely within the limits of audition, or in some cases higher than can be perceived by the ear; and it will be interesting to trace the relation between the definiteness of the sound shadow and the shortness of the sound wave. This flame is produced by allowing a jet of gas to issue under considerable pressure from a small nozzle, and by gradually increasing the pressure until the flame is on the point of flaring. 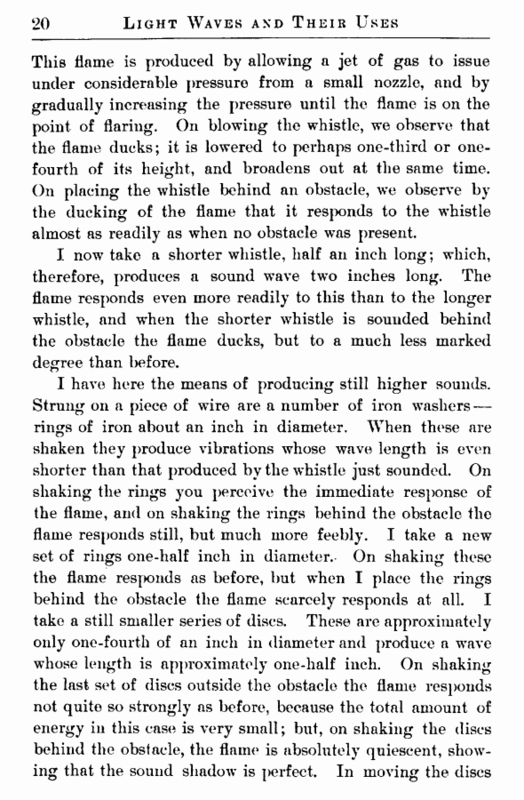 On blowing the whistle, we observe that the flame ducks; it is lowered to perhaps one-third or one-fourth of its height, and broadens out at the same time. On placing the whistle behind an obstacle, we observe by the ducking of the flame that it responds to the whistle almost as readily as when no obstacle was present. I now take a shorter whistle, half an inch long; which, therefore, produces a sound wave two inches long. The flame responds even more readily to this than to the longer whistle, and when the shorter whistle is sounded behind the obstacle the flame ducks, but to a much less marked degree than l>efore.